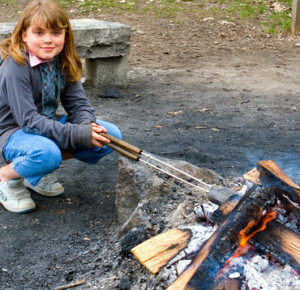 Kids love the fun stuff about camping. They get to run, play, swim, and eat special treats while they are camping and we all love to see them have a great time. They get even more out of it when you involve them in all phases of camping. Get them to help you with planning, packing, maintaining, and unpacking at home. They may mumble and grumble a bit but you’ll be helping them build a love of camping when they are grown with families of their own. Get the kids involved in creating a checklist of things that will be needed for the trip. They can let you know what foods they will enjoy eating and what toys and games they will want to bring. You can ask them their opinion on how things should be packed and what they should be packed in. Maybe each child can have their own backpack to hold their treasures or they may like to help pack kitchenware in plastic tubs. They can help mark them, too. The kids can help with unpacking once you arrive. They love to have an opinion about simple things like where the toiletries should go and where the pool toys should be kept. While you are camping they can be given responsibilities around the campsite. Maybe it is their job to set the table, make the beds, or keep the game pieces together. When you get home they can help unpack. They will learn about laundering the sleeping bags and getting them ready for the next trip. Many hands make light work and you’ll make far less trips to the car with the kids helping out. It really does give them a broad perspective on the work part of their vacation and teach them skills that will help them to continue camping for many years to come. They may grumble a little but they really will thank you later.